RALEIGH, N.C. – Life in the ACC has been tough for Brad Brownell’s squad in the month in January. However, no game has been a tougher pill to swallow for the Tigers than their 69-67 loss on Saturday in Raleigh. Clemson (11-8, 1-5 ACC) led by six with just 0:35 seconds left, but couldn’t finish off No. 21 NC State (16-4, 4-3 ACC) as Braxton Beverly hit the game-winning three-pointer just before the buzzer. Neither team came out sharp in the early after the opening tip was won by the Pack, but it didn’t take long for both sides to get good looks at the basket. Eli Thomas opened the scoring for the Tigers and finished with 18 points and six rebounds in a losing performance. The Tigers were led in scoring by Marcquise Reed, who finished with 19 points, but several missed free throws by Reed may haunt the Tigers. Markell Johnson led NC State, off the bench, with 16 points on 6-10 shooting. NC State came into the contest wanting to play fast, but Clemson was able to slow the pace in the early going taking a 12-7 lead early on. The Wolfpack bounced back with steady play during the final 12 minutes of the first half to take a 30-24 lead to the break with both teams pounding the ball in the paint. Clemson’s nine first-half turnovers didn’t help the cause, add in horrendous 3-point shooting (0-7) in the game, and the Tigers couldn’t get out of their own way. Even Clemson’s closer, Reed, missed four free throws in the final 0:13 seconds that would have most likely delivered a Clemson win. Brad Brownell, like Clemson fans, had one word for the loss: painful. “We played so hard. I thought our defense was outstanding. I don’t know that our offense was great today, to be honest with you. I thought we played better offensively against Florida State,” Brownell said. Aamir Simms got Clemson off to a good start just seconds into the second half to cut into the Wolfpack lead, but State responded and extended their lead out to nine on two occasions. Over the next eight minutes, the Tigers continued to chip away at the lead before going on a 12-point run to take the lead. Trailing 49-41 with 10:41 left, Clemson put it in gear on both ends of the floor as Reed and Thomas combined to score ten consecutive points giving Clemson the lead, 51-49. Clemson continued to control things, even taking a 66-60 lead with just 0:35 seconds remaining after Clyde Trapp split a pair of free throws. NC State’s Braxton Beverly then made one of two from the line, making the score 66-61 Tigers. The Pack quickly fouled Shelton Mitchell who also went one of two, bringing the score to 67-61 with 0:24 seconds left. 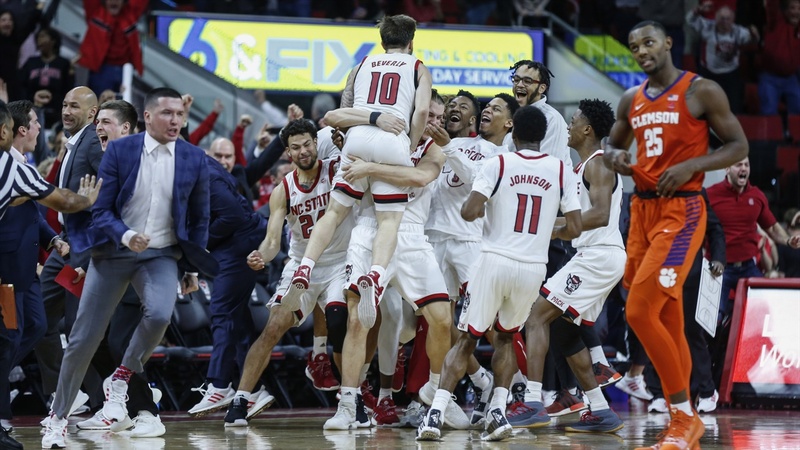 The Wolfpack answered with a three-point play from Johnson, who was fouled on a shot in the paint, making it a one-possession game 67-64 with 0:19 left in the game. Reed was fouled with 0:13 remaining but missed both attempts, opening up the door for the home team. Beverly was fouled and hit a pair of free throws trimming Clemson’s lead to one, 67-66, with just 0:07 left. Another pair of missed free throws from Reed, give the Pack one last chance and Beverly drained the game-winning three-pointer, sending the home crowd into a frenzy. After the game, Brownell expressed how bad he felt for Reed. Clemson will return to the court against Pittsburgh, Tuesday night at 9 p.m in Littlejohn.